After Noah Welch retired from playing hockey, he assumed he’d be a little less busy. But that’s the complete opposite of what has happened. Welch, who played defenseman at the professional level for 13 years, has become a successful entrepreneur. He has his hands in plenty of projects to keep him occupied. In February, Welch laced up his skates for Team USA in his first Olympic Games. He finished off his pro career in April by helping the Växjö Lakers win the Swedish Hockey League. Welch started transitioning for his career change a couple years ago. He tapped back into his Harvard network — he graduated from the Ivy League institution in 2005 — and hooked up with a good buddy who is a financial banker. Through his Harvard connection, Welch got involved with three business opportunities in Ghana in west Africa. Welch is an investor in OXYGEN Finance, which is a financial services firm. Welch is also involved in Ghana Agro-Processing and Technology Business Incubator (GHATBI). Ghana is primarily an exporting country, which exports pineapples and imports pineapple juice. GHATBI wants to change that. Welch’s third business venture is Biosphere Recycling. The company is helping Ghana and its residents do a better job at recycling. A massive project Welch and his company, The Sports Dome, is trying to get final approval on is a 125,000-square-foot multi-sport complex to go up in Red Deer in central Alberta. The dome would have a full-length turf soccer field, high-performance gym, multi-sport fields for baseball, lacrosse and other sports as well as batting cages. It’s geared toward anyone from two- years-old on up to those training to become a professional athlete or shooting for the Olympic Games. Welch is hoping to get the go-ahead for the project when the county council votes next week. If approved, Welch’s schedule would get even more hectic as the general manager of the complex. Hockey was all Welch knew for a big portion of his life. After getting selected by the Pittsburgh Penguins 54th overall in the 2001 NHL Entry Draft, Welch played parts of five seasons in the NHL with the Pittsburgh Penguins, Florida Panthers, Tampa Bay Lightning and Atlanta Thrashers. For the last seven years of his career, Welch played in leagues in Sweden. Welch’s professional hockey career stretched 13 years, but it wasn’t until the end when he had his biggest thrill. 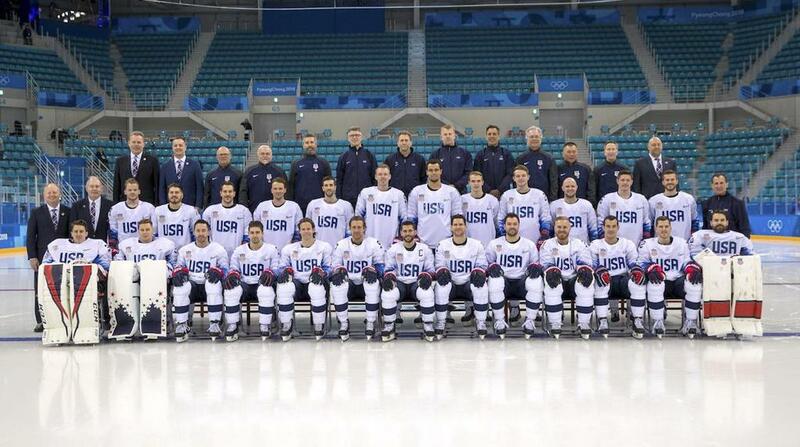 That was putting on the Team USA sweater and playing in the 2018 Olympic Winter Games in PyeongChang, South Korea. Even though it’s been nearly seven months since the Olympic Games, it’s something Welch thinks about constantly. His experience in PyeongChang was bittersweet since Team USA lost in heartbreaking fashion to the Czech Republic 3-2 in an overtime shootout in the quarterfinals. “Unfortunately, when I think back on the Olympics now the first thing that comes to mind is that we could have medaled,” Welch said. “That will wear off, I think. Don’t get me wrong, there were some incredible memories and it was truly an honor to play for Team USA, be one of the captains and play for Tony [Granato] and their excellent coaching staff. But the competitor in me is still there, that doesn’t die when you retire. To lose in a general shootout in the quarterfinals still really bugs me.